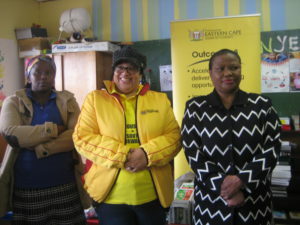 Sibanye Day Care Centre Supervisor Nomalungisa Maloni was grateful for the visit to the facility by Human Settlements MEC Helen Sauls-August and Makana Mayor Nomhle Gaga. 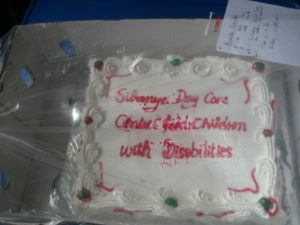 There was a cake for the children. The teachers and children of Sibanye Special Day Care Centre received a surprise visit from the MEC of Human Settlements, Helen Sauls-August on Friday 25 August 2017 during her visit to Makana Municipality. Gifts incuding matresses, toiletries and non-perishable foods were handed over to the centre. The principal of Samuel Ntlebi Primary School, Dudu Myemane, has made a classroom available for the facility that cares for disabled children in Grahamstown. The Centre has been running for three years. According to one of the teachers and supervisor of the centre, Nomalungisa Maloni, they started with only three children and the number grew to ten. “We arrived here with nothing and then the Rotary club helped us to buy equipment and we were then able to buy ourselves uniforms for work. We had hope that one day we will cook for the kids, but unfortunately we have not yet received funding to do so,” said Maloni. She added that although they provide porridge for the children in the morning only, parents are not putting enough food for the day. “We saw that there are a number of schools such as Kuyasa Special School, which admits disabled children starting from the age of seven upwards, but there were no schools catering for children from three years. 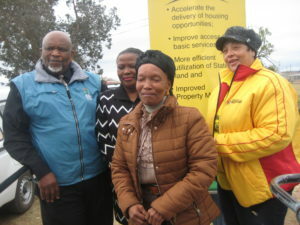 This led us to opening Sibanye Special Day Care Centre,” said Maloni. “These children are very sweet they just need good people with love, care and happiness,” she said. Maloni said often such children are locked up in their homes. “We want them to explore and see that there are other children like them,” Maloni said. She said the school currently has received no subsidy since it opened and relies on the school fees from the parents. Sometimes these are not paid. “We would be very happy if the people could help us with anything they can in order to run this centre,” she said. Mayor Nomhle Gaga said the MEC’s visit to Makana came at a significant time – at the end of Women’s Month, and approaching the city’s bicentenary. Gaga also thanked the teachers. “You are working with the little that you have and you are making us proud said the Mayor. Noting the significance of having the occasion during Women’s Month, Sauls-August said, “The principal is a woman, the carers are women, the Mayor is a woman and the MEC is a woman.